For most Americans every penny counts when it comes to their paycheck, but for some workers nearly a quarter of their wages are taken to pay for past debts in a process known as garnishment. The prevalence of this type of pay seizure grew significantly in the last few years leaving more consumers struggling financially. A new report [PDF], requested by ProPublica and compiled by payroll provider ADP, found that more than 1-in-10 (around 7%) of all employees between the ages of 35 and 44 had their wages garnished last year. With debt associated with student loans, credit cards, and medical bills rising, experts say they have seen a shift in the types of debts being garnished. Unpaid child support was the most frequently given reason for garnishing wages, accounting for 41.5% of all seizures. Around 35.4% were made for student loan and court-ordered consumer debt repayments on things like credit cards and medical bills. 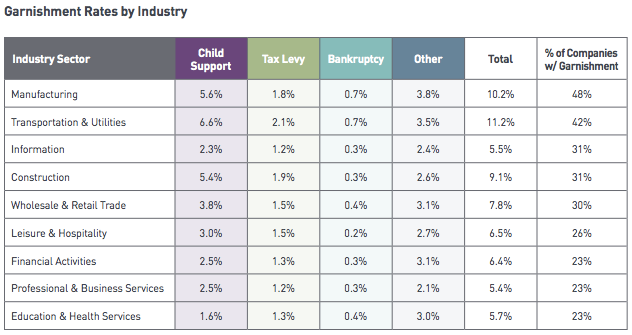 Additionally, 18.3% of garnishments were deducted for tax levies and 4.9% for bankruptcy. When the statistic is expand beyond the 13 million employees in the study to the nation’s entire population it reveals that about 3% or 4 million workers had wages garnished for consumer debts. Consumers aged 35 to 44 were far more likely to have wages seized for debts than those in other age groups. Perhaps unsurprisingly the report found that wage seizures were most common among middle-aged, blue-collar workers and lower-income employees. Nearly 5% of American’s earning between $25,000 and $40,000 per year have a portion of their wages deducted to pay for consumer debt. Blue-Collar workers were more likely to have wages garnished than those in other sectors of employment. 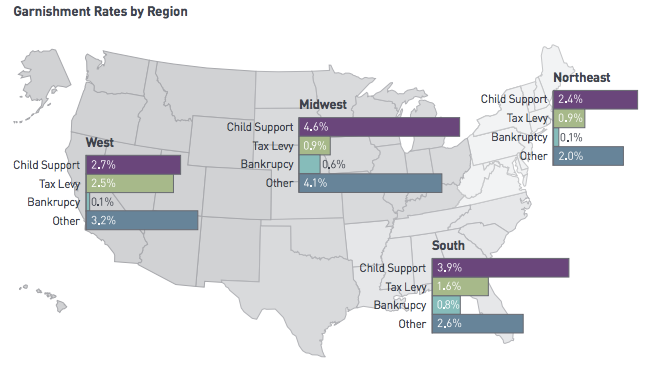 Laws regarding garnishment varies significantly from state to state, which means some regions were more affected by the wage deductions than others. The Midwest recorded the highest rate of garnishments with more than 6% of employees, or one in 16, who earned $25,000 to $40,000 having had their wages seized for consumer debt in 2013. The high figure in the Midwest, may be a result of the relatively creditor-friendly laws in some states. Missouri, for example, creditors are allowed to seize 25% of an employee’s after-tax paycheck and can continue to charge high interest rates even after judgement is awarded. Garnishments varied significantly in each section of the United States because each state’s laws regarding pay seizures are different. Kevin, of Springfield, MO, found his paycheck was 25% lighter after Capital One began garnishments for his $15,000 in credit card debt leftover from the recession. While the 58-year-old has paid more than $6,000 toward the debt through the garnishment, he still owes more than $10,000 because the high interest rate allowed in Missouri. Other states, such as Texas, Pennsylvania, North Carolina and South Carolina, largely prohibit wage garnishment for consumer debts. Although state law governing the amount and frequency of garnishment varies, the process to commence deductions begins much the same way, with creditors filing suit against the debtor in local courts. A review by ProPublica of court records in eight states found that the bulk of suits are filed by major credit card lenders, medical debt collectors, payday and installment loan lenders and debt buyers – those companies that purchase unpaid credit card bills. While most creditors and collectors are represented by lawyers, debtors – who are usually in tough financial situations or unfamiliar with the court system – generally aren’t. That means the debtors often don’t show up and the creditor or collector asks for a default judgement which paves the way for pay seizures. And once the judgement has been handed down, collectors and creditors have the ability to pursue garnishment for the life of the debt; meaning that even judgements from years ago can be pursued if the debt is still owed. An associate circuit court judge in St. Louis tells ProPublica that the court system is designed to give debtors a chance to dispute allegations, but most don’t take the opportunity. 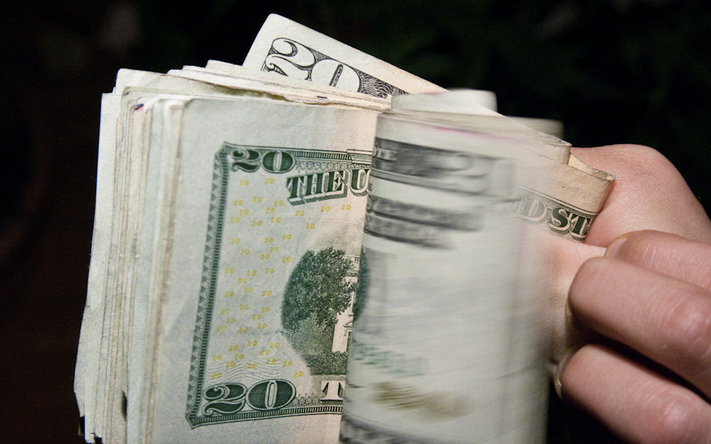 So most cases end with the debtor losing significant chunks of their paychecks each pay period. Still, collectors and creditors tell ProPublica that pursing a lawsuit against a debtor is always the last recourse used. ADP reports that employers can often assist workers in avoiding costly garnishments by offering financial counseling, budget education and preventative financial wellness training. Additionally, consumer advocates tell ProPublica that more needs to be done to protect already vulnerable consumers.